Atherstone is a curious town, setting on the ancient Watling street, about give or take 100 miles from London, famed for its hats and now a great place for books…it one of those British towns which has gone through many phases but never aspiring to be a metropolis – happy to be a small county town. A small proud county town it is at that – justly proud of its Ball Game. There are of course a number of such games, and I have covered Hallaton and Sedgefield in my accounts..there’s something a bit to coin a term often used in football ‘ a bit special’ about this one! What time? No date is given. Hugh Hornby in his excellent compendium of football games Uppies and Downies states that even if John did grant it on his accession he didn’t become king until the 6th of April! Never mind. It is certain that the Game has a long origin and was certainly continually played from the 1700s and despite the absence of any mention of the custom in the 1700s we can assume it happened. The meeting apparently concluded to support the custom and continue removing panes of glass from the gas lamps. The game went ahead, despite Warwickshire Country Council’s wishes and so it has been – ironically that same council trumpet it as a tourist event – how times have changed! 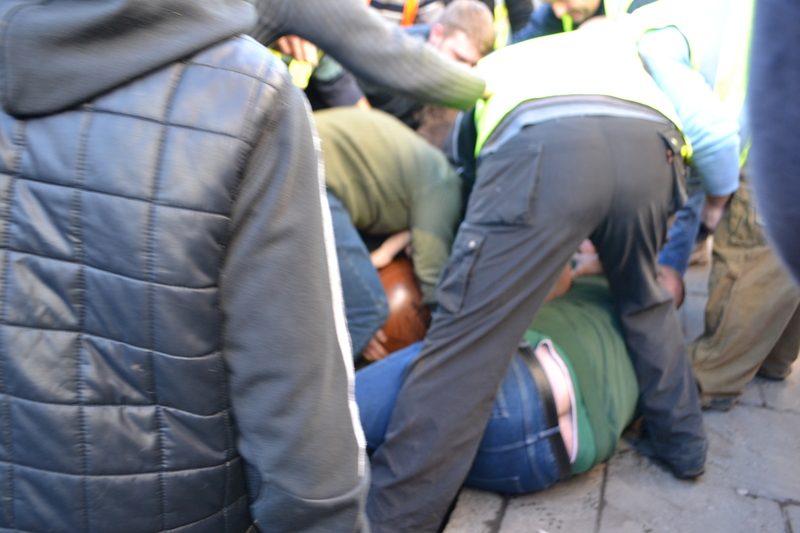 The game continued unabated until in 1974 an committee was established to organise it and focus the action in Long Street and prevent the rampage around the town and then in 1986 established players were used a stewards. 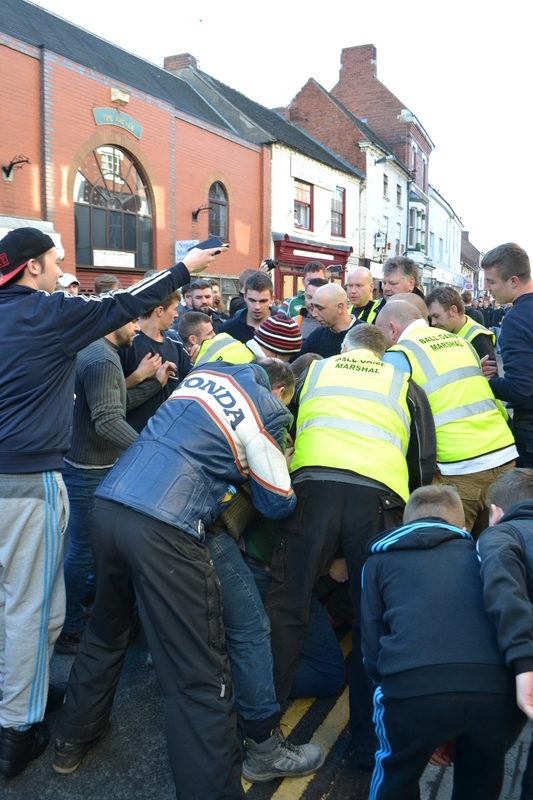 Indeed the focus in one street meant that unlike other more rural shrovetide games it was saved from a ban in 2001 foot and mouth outbreak and continued through both World Wars. One of the reasons why it has remained I believe because unlike its counterparts it is far more a spectator sport. The ball is much larger and hence more visible in the scrum, it is focused on more place and more importantly everyone gets a chance to kick it. For during the first 90 or so minutes the game seems quite complexing – is this a ‘game’ or not? Why is no one trying to score? During this time all and sundry are given a go. I saw children of all ages getting involved, women – including quite an elderly one I feared might fall over and even a policeman! There’s no competition only for catching it and returning it and often a steward is on hand to make sure anyone who wants a kick has a go. This is clearly a great way to engender both interest and inclusion and whether or not any of the kickers really get involved in the game is irrelevant they had a kick – added to the apparent luck of doing so – its eagerly taken on. I must admit to having a soft spot for Atherstone’s football and its only one of two I have been to more than once because of its accessibility. 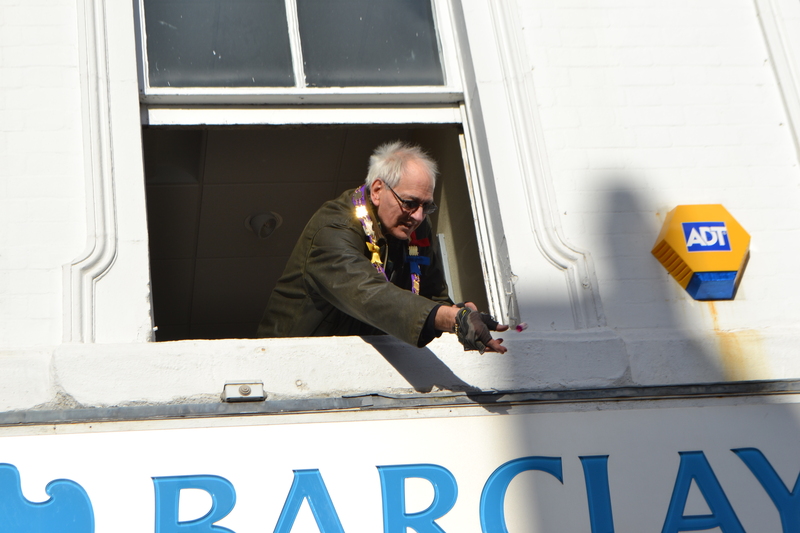 The last time I went I had come fresh from a pancake race elsewhere to be confronted with another just about to start down Long Street by the Major and other local dignitaries. A nice addition. 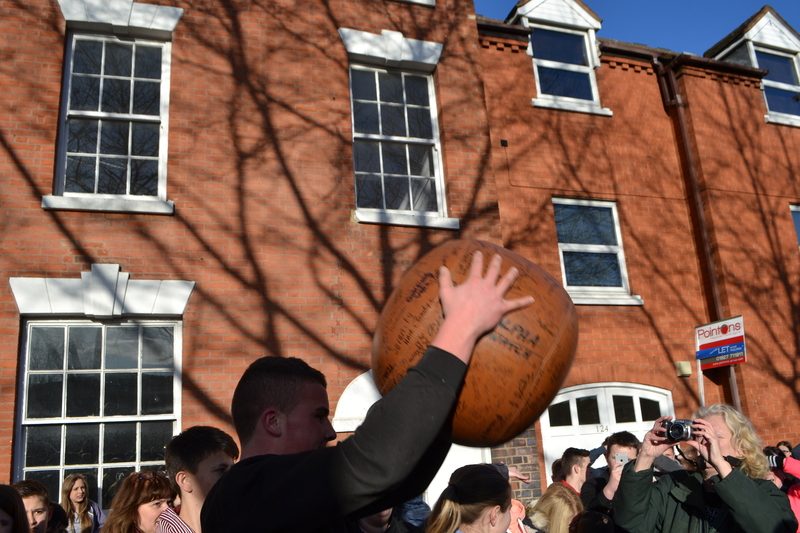 Indeed, Atherstone’s Shrove Tuesday is not just about the Football it developed another custom to compliment it – a sweet presumably originally a penny scramble. 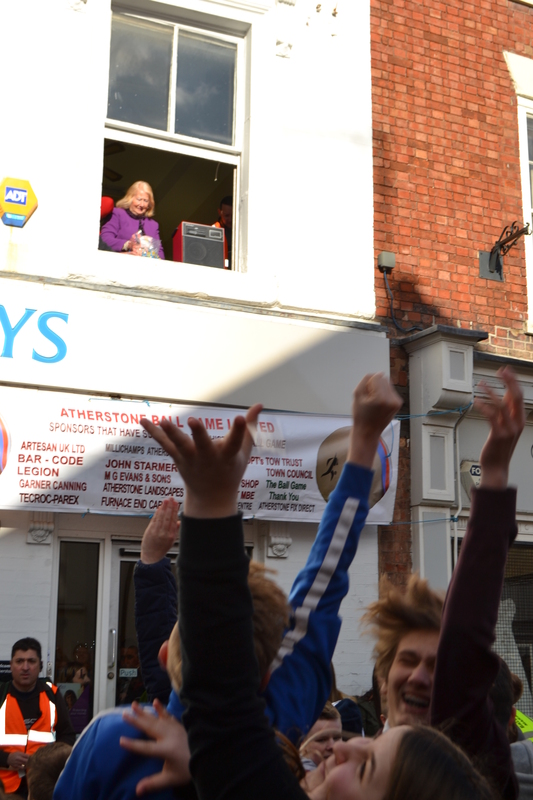 With the addition of the pancake race it could be seen to be developing a shrove tide triathlon! The sun was bright and the white walls of the Angle Inn glistened its warming rays as a crowd of youngsters gathered beneath it. In the windows shadows can be seen. The children below appeared to move closer and stand eyes gazing up and hands ready. Soon a plastic pot appeared and a hand. Then a hand full of sweets and then to cheers below the sweets were cast upon the crowd. The children ducked, dived and tussled below. As more and more sweets descended the crowd went crazier and crazier. The face of the children more determined and fevered. It was quite intense and after a while it was clear that some of the younger children were dragged out of the mix. In the distribution was a giant Golden penny I saw it go out…but didn’t see it after, but presume the lucky child returned it for the £10 prize. The scramble was a clever device, a way both to attract fresh blood to the football, get them trained for the future and possibly satisfy their need to get into the throng. Then at 3 pm a new face appeared at the window. The children had dispersed and those that hadn’t were quickly removed. Now a new crowd arrived. Often burly men, clothed in rugby shirts and old jeans and trousers, probably ritually worn each year for the game. The guest of honour appeared holding the ball. A cheer went out and people positioned themselves. Interesting I noticed a few likely characters standing a drift from this throng..biding their time and conserving their energy for the right time to pounce on the ball. For unlike other Shrove football competitions and similar, there are no goals and unlike others there is a time limit. The winner? They who should have the ball when the horn is sounded. It was thus wise to wait. Then after a pep talk from one of the organisers asking for good conduct the ball was held ready to be through, attached to it three ribbons and off it went. The ribbons did not last long as the ball made its first appearance from the throng a few minutes they were gone grabbed by the attendees and again latter exchanged for their £10 prize money. Then around 4.30 the crowd became to thicken and the ball’s direction changed. The game had really begun as the first attempt was made to take control. A big kick sent it down the street to a waiting pair of hands. The crowd surged towards it. It soon disappeared. The ball surfaced again. The crowd separated into participants and observes. The throng rushes downhill as the ball is kicked out of sight. I rushed down as a wall of people are looked against a wall with the ball somewhere within. The ball breaks free and is kicked again up the street. It does not go far as the throng and ball bow to gravity and roll further downhill. A steward steps in and a break occurs to refocus back to prevent it spilling too far. The ball is seen for a fleeting moment and then its gone. Too and fro. Piles of bodies encase the ball. Then it is out off and with it the crowd. Those watchers appear then to make their move, fresh of energy then enter the fray, ready to put their full weight and effort taking possession. 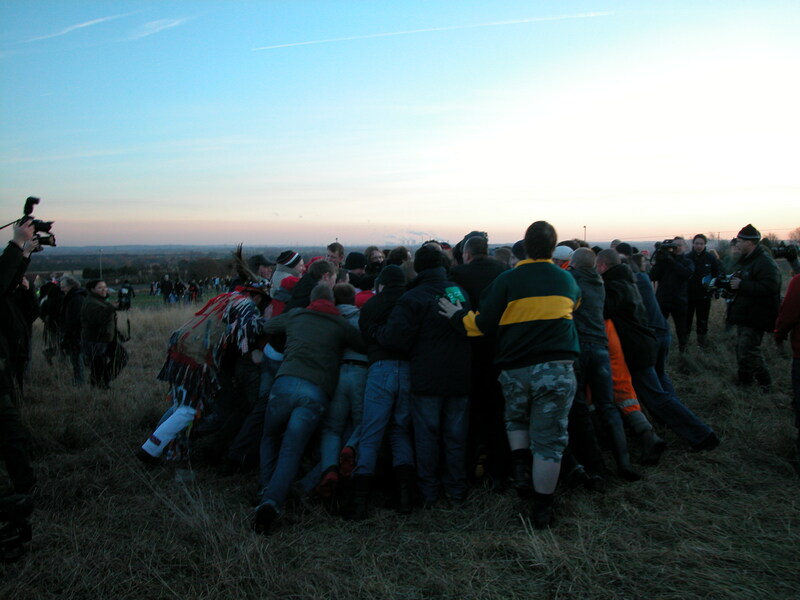 Then the horn sounds, a cheer is let out, but the scrum does not disperse readily the scene is brightened by the reflective coats of the stewards, who now gently peel the bodies from each other to release the ball and the winner. Weary, bruised, shirt torn, sweaty the winner emerges, a smile beams across his face – he’s won – the ball looks a little worse for the encounter, its flat and devoid of any spherical appearance. Everyone is off to celebrate and it is over for another year.